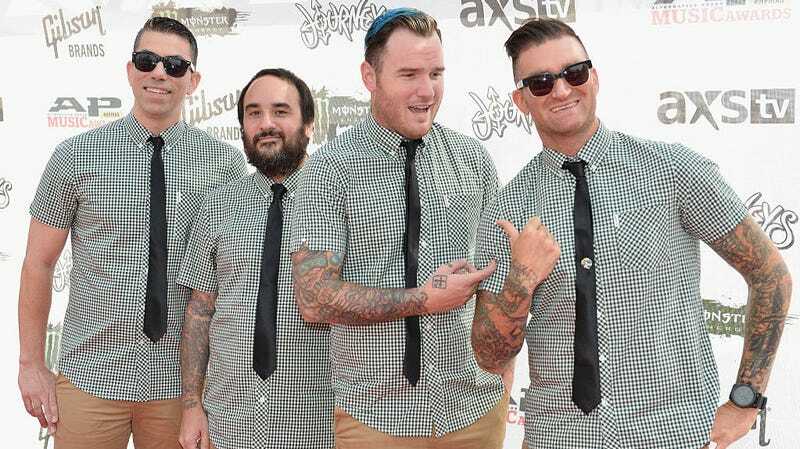 Oh, the hubris of New Found Glory. When ScreenCrush asked the seminal pop-punk band to name their 10 favorite uses of pop-punk songs in films, they maybe thought the band might find a way to squeeze themselves on the list. What they likely didn’t expect was that the band would do it three times, twice for the same song. That, however, is exactly what happened. After reaching back to the distant past of the early- to mid-00s, drummer Cyrus Bolooki decided that his own band’s song “The Minute I Met You” from the film Clockstoppers should be in the #10 spot, while single “Hit Or Miss” should be #9 and #2 for its usage in both The Benchwarmers and American Pie 2. “Yes, we’re on this list twice with the same song, but why not?” is as close as Bolooki gets to an explanation for this bold power play. It should be noted that “Hit Or Miss” isn’t even on the official American Pie 2 soundtrack, though the song does appear in the film. Some might argue that Sum 41's “Fat Lip” is the more iconic pop-punk song from that flick, but New Found Glory would likely point out that, actually, that song is not by New Found Glory and, thus, has no place on this list. The band wasn’t so bold as to give themselves the number one spot, however. That honor went to Green Day for their song “J.A.R.” off the Angus soundtrack, which is honestly a pretty great pick. What&apos;s the first movie soundtrack you loved?